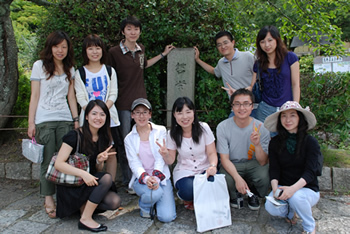 Visit to the ancient Japanese capital of Kyoto to experience the traditions and culture of the country, as well as to visit Ritsumeikan University and Kyoto University for exchanges and tours of university premises aimed at deepening ties among scholarship students. 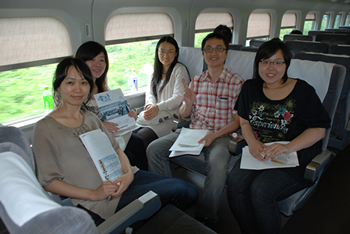 On the train to Kyoto. 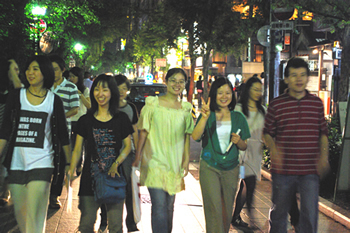 Excited over the trip that is about to start! 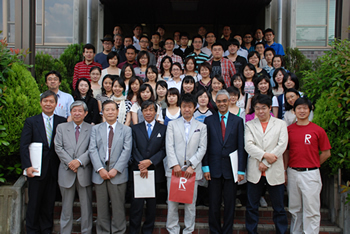 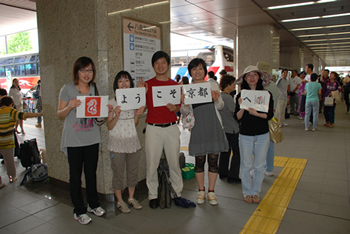 On arrival, the group was met by 5 Akimoto Tatsunoko scholarship students studying at Ritsumeikan and Kyoto universities. 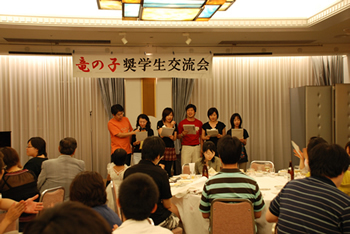 These 5 people not only guided and helped the group but had organized many enjoyable programs. 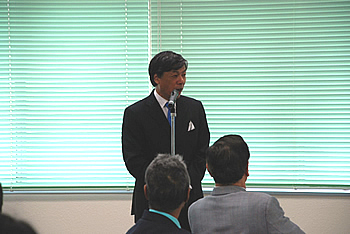 The meeting started with welcome messages from Ritsumeikan Vice-Chancellor Honma Masao (top) and Ritsumeikan Asia Pacific University President Monte Cassim (bottom). 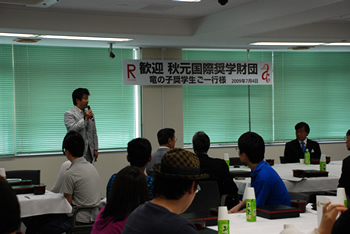 Chairman Akimoto expressed thanks to the Ritsumeikan University officials who organized the wonderful meeting. 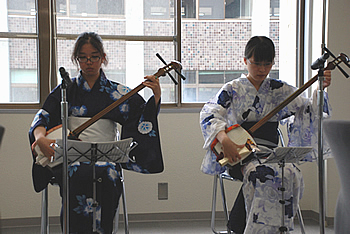 Ritsumeikan students welcomed the group with a shamisen performance. 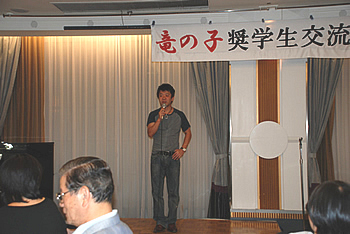 A commemorative photo was taken at the end of the meeting. 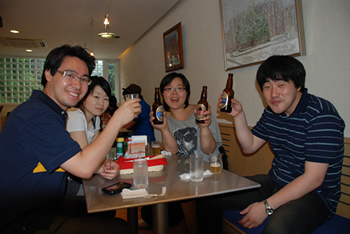 Thanks to the people at Ritsumeikan, the Kyoto trip was off on a great start. 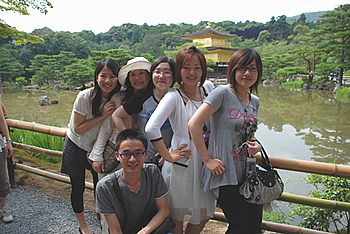 Akimoto Tatsunoko scholarship students posed in a variety of ways for snapshots with the shimmering Gold Pavilion in the background. 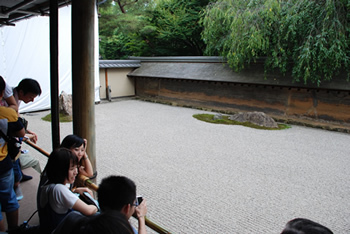 The group took time to appreciate the famous Rock Garden of Ryoanji. 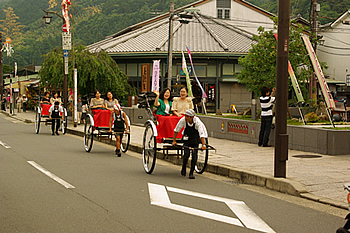 Although the beauty of Mount Arashiyama and the river was impressive, the most unforgettable experience there was the jinrikisha ride, made possible by the program contributors who participated in the trip. 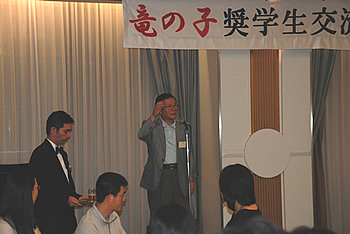 The reception started with a speech by Chairman Akimoto and a toast led by Professor Kotani. 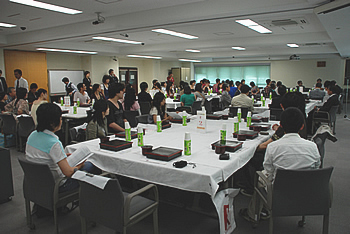 The reception planned, set up and moderated by Akimoto Tatsunoko scholarship students at Ritsumeikan and Kyoto universities was so enjoyable that everyone felt it ended too quickly. 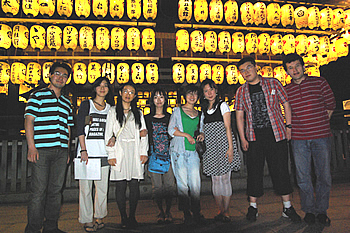 Starting at Yasaka Shrine, the students walked through Gion and Ponto-cho and enjoyed the walk at night for about an hour. 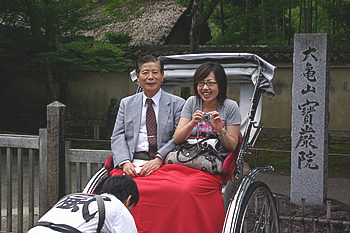 The second day of the trip started from Ginkakuji. 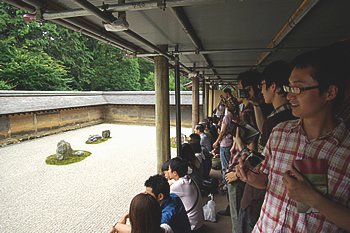 After touring the temple, the group strolled through the Philosopher's Path. 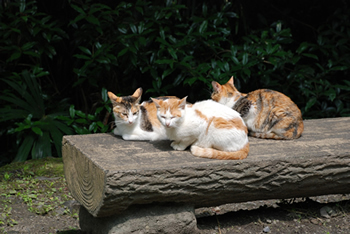 Encounter with "Philosopher Cats" on the way. 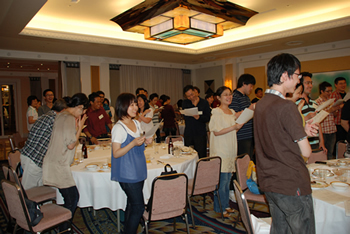 The exchange meeting at Kyoto University took place at a restaurant named Camphora. 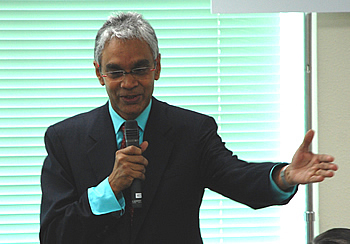 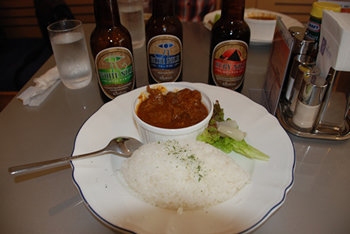 The group enjoyed the university's famous "President's Curry" along with beer. 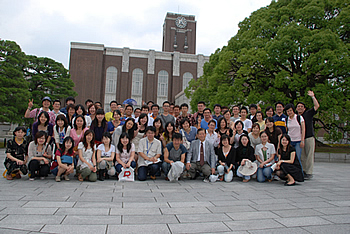 After the meeting, the group toured the clock tower and the library. 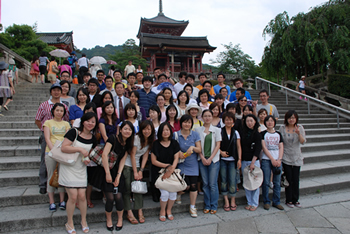 The last stop on the tour was Kiyomizu Temple. 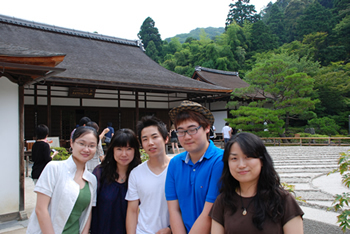 The students were impressed by the height of "the stage of Kiyomizu." 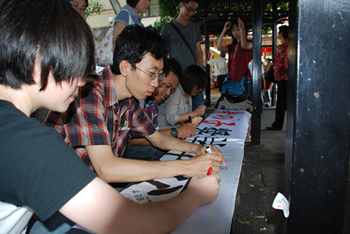 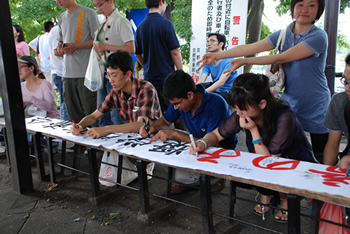 After the tour, all of the participants jotted messages at the rest stop. 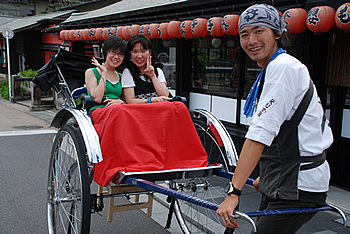 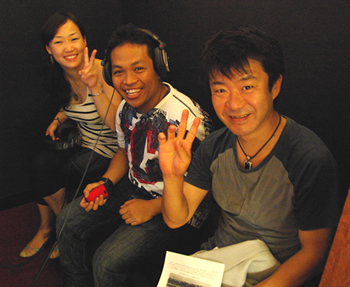 The itinerary was filled with exciting and pleasant programs and became a trip to remember.